Tony Post, CEO of Vibram USA, makers of FiveFingers, on the brand’s barefoot shoe premise and why consumers are increasingly buying into the health benefits associated with natural movement. Tony Post, a competitive runner of more than three decades, always ran the way his running shoes intended him to: heel-strike first, then a roll-through cushioned by layers of midsole shock-absorption technologies. And for decades it proved to be an effective method as Post completed countless marathons and shorter race distances. But one day, Post’s knee gave in to the wear and tear that not even surgery and extensive rehabilitation could repair. It appeared his running days were over. But as luck would have it, Post’s day job as CEO of Vibram USA in Concord, MA, involved not only expanding the outsole maker’s penetration in the outdoor and athletic footwear markets (see “Post Time,” p. 15) but also introducing brand extensions that would enhance the company’s image and reach. One of those extensions happened to be a “barefoot shoe” premise created by a young industrial designer and naturalist living near Italy’s Dolomite Mountains. Rudimentary prototypes caught the attention of Marco Bramani, the grandson of Vibram founder Vitale Bramani. The beta product would eventually become FiveFingers—the funky-looking shoes that fit like a glove and are designed to exercise the wearer’s feet naturally, thereby improving strength, balance and agility. Product benefits aside, these shoes were truly “out there” from a traditional footwear aesthetic. Few, if any, could have predicted the success that would follow the FiveFingers launch in April 2006. The list of skeptics included Post—until he became a running testimonial for the brand. 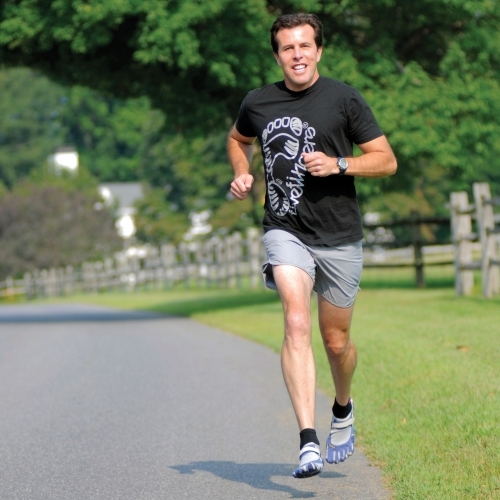 Frustrated by his knee injury, Post decided to see if he could run in a pair for a mile. The company had recently enlisted Dan Lieberman, a human evolutionary biology professor at Harvard, to research its barefoot concept, taking into account his studies that stated early humans literally ran animals into heat exhaustion as a way to capture food before they discovered the use of spears. “This got us interested in the idea that people used to run without running shoes,” Post explains. Just what have you tapped into here, despite the fact that FiveFingers look really weird? I think that for a lot of people the footwear just feels good. Right off the bat, there’s a visceral sensory experience. The second aspect, which is associated with our positioning as a performance product, is that wearers really take advantage of the features that the product delivers. For example, enthusiasts of cross-fit training—a vintage method now being adopted by sports teams, police academies and the military—are looking for ways to strengthen their bodies not just by using machines but in more natural ways. They do a lot of kettle bell and endurance training, and FiveFingers work well for those activities. I don’t think it’s for everybody, and we are OK with that. There are always going to be some people for whom it’s not the right product, either physiologically or [aesthetically]. I don’t think we are ever going to find a product that appeals to everybody. Could FiveFingers have been successfully launched 15 years ago? Or is the world more open to this concept now? It’s hard to say. Good ideas are a combination of the right environment and letting consumers see and experience their relevance. People talk about this current wellness movement, but I spent the better part of the ’80s and ’90s trying to convince people to exercise for improved health and a better lifestyle by walking. I think wellness has been relevant for a long time—since the jogging boom of the late ’70s. You could even cite the physical fitness craze of the early ’60s during JFK’s era that first got people thinking about improving their health. What’s your take on other ‘barefoot shoe’ concepts? I certainly respect innovation. When people create their own new and interesting ideas it makes for a stronger, more vibrant market and it serves consumers better. That said, clearly there are going to be people who try to copy FiveFingers. We do a pretty good job of protecting our intellectual property—we have nearly 40 patents developed in FiveFingers. The reason we do this is to ensure we deliver the full experience and somebody else doesn’t make something cheaper that doesn’t deliver and sours somebody’s taste on the FiveFingers concept. Might we see a barefoot shoe section in stores some day? I think there will be more footwear concepts that encourage more natural movement in general, and that’s a good thing for consumers. There will be lots of people who will create interesting designs that will evolve from this. And there already are a few—Vivo Barefoot [by Terra Plana] does a nice job of offering a barefoot experience. How does barefoot fit alongside the rocker-sole wellness craze? It’s a little different. I respect what some of those brands are doing, but again you could go back to the Earth shoe of the ’70s and its wave sole, and Rockport used to market its rocker profile during the ’80s. I don’t want to take anything away from MBT, as they have done a very good job of delivering an experience and I see people wearing them all the time. Consumers are clearly finding it a rewarding experience, and that’s good for retailers. They are creating innovation with the idea of improving the quality of people’s lives, and how can that be a bad thing? In my opinion, the wellness category presents enormous potential going forward. I agree. To me, wellness is a more proactive approach to comfort footwear. Specifically, with FiveFingers you’ll strengthen the muscles in your feet, improve range of motion in your toes and ankles, and improve neural function—which is important to balance—and agility as well as spine alignment. That’s all connected to wellness, and there’s nothing wrong with that. Can FiveFingers co-exist peacefully alongside traditional running shoes? There are two ways to answer that. One: Consumers deserve an alternative. That said, some people use FiveFingers as a training tool for all the benefits I just described and may use traditional footwear at other times. Second: FiveFingers are not for every occasion. I wouldn’t climb Everest in a pair or wear them on a 5-degree day or in certain work environments. You still need boots and shoes for many occasions. Second, I believe that we’ve been pretty upfront from the very beginning—we showed the product to all of our key wholesale customers before we launched it so they knew what we were doing. Besides, not all of our customers use Vibram soles exclusively, so fair is fair. More importantly, it’s an additional sale for the retailer, and I think our customers realize that as well. We wanted to showcase innovation and raise the profile of the Vibram brand in a way that would also help our sole business. FiveFingers has delivered on that goal. Can running companies make a barefoot model based on their traditional designs, or is that contradictory? The next couple of years are going to be quite interesting for the running market. We post plenty of links on our Web site that suggest that midsole cushioning and pronation control technologies of the past and even now might not necessarily have been a good thing. Maybe injuries didn’t really decrease during this period, despite all of the money that was spent on technology, advanced concept development and marketing. The reality is that people are still getting injured and then they can’t run; and if they don’t run, they are not going to buy running shoes. Wow, what if the athletic companies were approaching shoe design all wrong? Well, it depends on the individual. I’m affected in both ways: I’m a part of the footwear industry and I’m also a consumer who has been an avid runner for 35 years. If I weren’t the president of Vibram FiveFingers, I would be grateful that the product came along because I can run again. And while I don’t know if everything the industry did before was wrong, I do know there’s something right about FiveFingers. I think the jury is out for some people, but we believe that this is a healthier way to run and move. Taking into account the rapid growth of FiveFingers, might you be one of the few people optimistic about business right now? Well, keep in mind we still have a very mature business in the sole industry, so we suffer along with other brands when their business is down. Thankfully, certain partners’ business is still pretty darn good—like Merrell, Ugg and a few others. Certainly, the work boot market is feeling the economy the most. In the meantime, we’ll continue to develop new concepts and innovations and target new market segments. From your career perspective, has 2009 been unlike any other year? Actually, 2008 was the most unusual year for me. All of us were confronted with the incredible price increases in China—the cost of materials was increasing far faster than we could pass those costs along. Everybody took shorter margins while gritting their teeth through the challenges. And once all of that product was delivered to market, the financial crisis put such a halt on retail that inventories backed up. While that lack of demand allowed prices to go back down, it didn’t really help, as no one was buying. Are we now on a path to a more normal business environment? I do think that the market has stabilized. Retail is still not good, but fortunately with the numbers we are going to be up against versus last year, things should come out in our favor next year. Overall, consumers are still being cautious. But anytime you have something interesting that improves the quality of their lives, I believe people will buy. What has been the biggest change you’ve seen among your retail and wholesale partners? When things get tough, retailers tend to hold off on bringing in new brands and wholesalers decide not to open new molds. But sometimes playing it safe is the riskiest thing you can do. You have to take some portion of your portfolio—whether it’s 10 or 15 percent of your open-to-buy—and dedicate that to something more speculative. It may or may not pay off that time, but I think that approach puts you ahead of the curve for when the market does turn around. And more times than not, you will succeed with something that you speculated on. It’s easy for me to say that in regards to FiveFingers now, but that’s exactly the approach we took. We were a 70-year-old brand making soles. Did people [expect us] to make footbeds next? Or, [we thought], do we really try something different—footwear like nobody else is making? When it first came out, a lot of people laughed at our product and thought we were crazy. Sometimes you can get so mired down in your business that you need a little wake-up call and need to look elsewhere. It makes you think and might start a chain reaction. But I would recommend focusing on what you think might really work—if you truly believe in it, a lot of times that makes all the difference. In the case of something as unconventional as FiveFingers, did you offer any added incentives or deals to entice buyers? We didn’t, but the entire line is already keystone-plus so that everyone can make money. Whether you order the 36-pair minimum or 3,600 pairs, it’s the same price. Admittedly, retailers and consumers first asked, “What’s this, a $75 aqua sock?” But once everyone realizes that it delivers on all of its proclaimed benefits, plus the fact that retailers can make money, everybody is happy. We focused on three channels of distribution—outdoor and running specialty and premium independent shoe stores—because we want retailers who will take the time to explain in detail the features and benefits of FiveFingers. Even though we sell it on our Web site, the product is best served by a sit-and-fit experience. Few others are happy with the traditional sell-in/sell-through process. How come? I don’t know where it really starts. Is it the lack of compelling product that has driven down prices so there are less margins to go around? Would making more interesting product at a premium price without over-distributing fix the problem? At some point you have to say no to certain accounts because it might take your brand in the wrong direction. Similarly, retailers have to refrain from marking a product down to match price because that will take them down the wrong path as well. You have to stand by your convictions at a certain point and be willing to pay the consequences. Sometimes you can get so caught up in trying to do so much business that you don’t build a business that is sustainable. It’s the same for how you develop product. Sometimes a brand will come out with 50 new shoes but there is really not one shoe in that mix that is truly compelling and addresses what consumers really need. You know, eBay was created so people could get rid of stuff. This is a whole country of people who don’t need more stuff. We just want the right stuff. So make less stuff and make it right—stuff that works, improves someone’s life with great product and you will make a difference. How have consumers changed amid the Great Recession? The financial crisis has had an impact. For a long time we have been the country of “more” and “bigger.” I think after a year like this feels maybe people won’t go out and blow the bank on stuff they don’t need. But at the same time the world is not going to end either, so it’s OK to shop again. Whether it’s people buying less, looking for better quality or not buying beyond their means, I guess we’ll see what happens. Personally, I think things were out of control before. I don’t wish for anyone to be unemployed and I want the economy to improve, but the world before the recession probably wasn’t healthy or real. So now we have a more discerning consumer who buys what he or she really needs. Yes. And alongside that, people are returning to a more simplified approach to life that embraces naturalism. FiveFingers drafts on both of these trends, and that’s why the brand has broad adoption here and overseas, [a growing market that] is still in the early stages for us. But with the power of the Internet, I’m getting 2.5 to 3 million page views a month and 10 to 12 percent of that traffic is coming from overseas. This brand has all been driven by word of mouth. And I think people tend to root for something new—they like the idea that they’ve discovered something unique. That’s been our strength all along. Often somebody will post a picture of our shoes on a Web site and the first five comments will be along the lines of, “Those are ugly…” But if you keep scrolling down, you’ll eventually see supportive comments of what FiveFingers has meant to a person’s life and recommendations from someone to try a pair. We just stay out of the way. The consumer usually finds what’s right.